Wednesday Night Dinner resumes this Wednesday at 5:30PM in the Great Hall! Also, our Wednesday night kids program lets kindergarteners through 5th graders enjoy a fun, loving, Christ-centered atmosphere filled with Children’s devotion, games, crafts, songs and more. Childcare is available for our younger children. 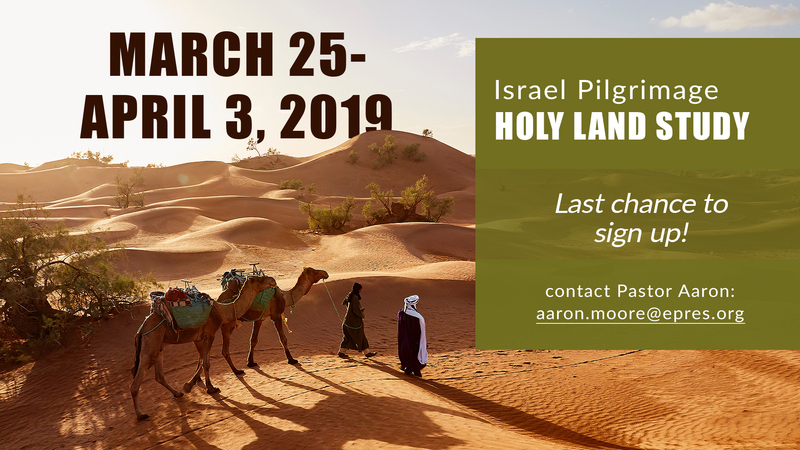 — Israel Pilgrimage Holy Land Study: Last chance to sign up! If you’re interested in joining Eastminster on this life changing trip from March 25-April 3, contact Pastor Aaron at aaron.moore@epres.org for more information.